I originally shared this post over at my friend Cynthia’s at Feeding Big. 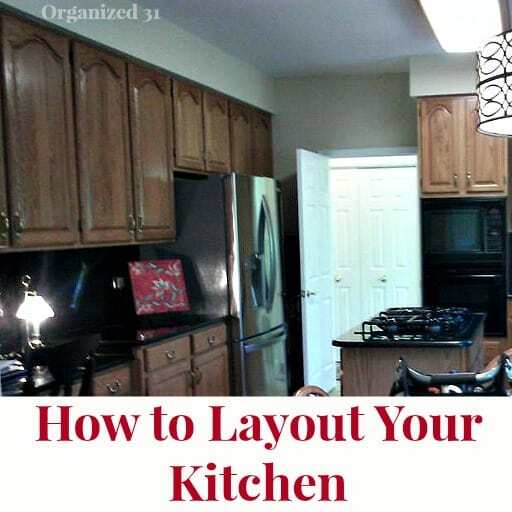 Today I’m happy to share with you some tips on how to layout your kitchen to make your life easier. I don’t know about you, but my life could use some more easier in it. As part of a military family, I’ve moved into 25 different homes and have picked up a few tips along the way to help you figure out how to layout your kitchen in the way that is best for you and your needs. Step back and look at your kitchen. Where is your fridge? Stove? Sink and dishwasher? 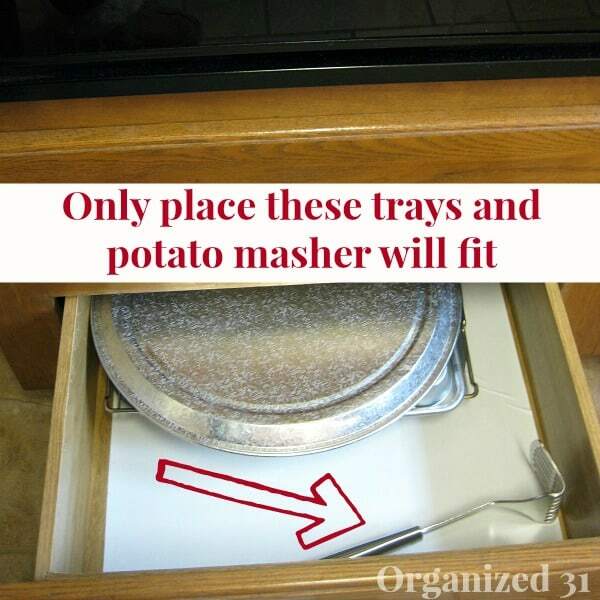 Where is the best drawer to put your silverware? Where’s the best cabinet to put your cookie sheets and cutting boards? Where are the problem areas in your kitchen. You know that spot where there’s a traffic jam all the time. Where are you going to put the pet food bowls? (funny how you don’t see those very often in those lovely magazine kitchens) Everyone’s kitchen and family are different, so keep in mind your specific situation. Keep pots and pans near the stove. Keep plates and dishes either near the dishwasher (to make it easier when you put them away) or near the table (to make it easier to set the table). Put the glasses near the fridge (where you’ll be pouring drinks). Put the coffee mugs near the coffee machine. 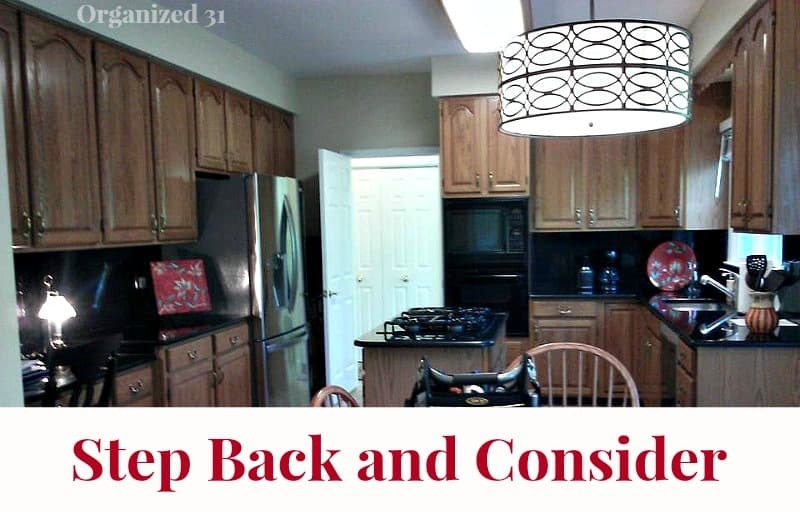 Setting your kitchen up this way saves you many steps walking across the kitchen to get an item and then more steps to take it to another area to use it. Makes sense, right? But I’m continually surprised when I go to someone’s house and they’ve placed items across the kitchen from where they use them. Unless that’s part of their long-term exercise plan. Put all like items together. This saves walking around time again and it saves your brain trying to remember where you put something. So, for example, make a baking zone and put all the dry ingredients you use in baking, the bowls, mixer, sprinkles, cake pans, etc. in that area. How about a coffee zone with your coffee maker, coffee mugs, sugar, artificial sweeteners and spoons. 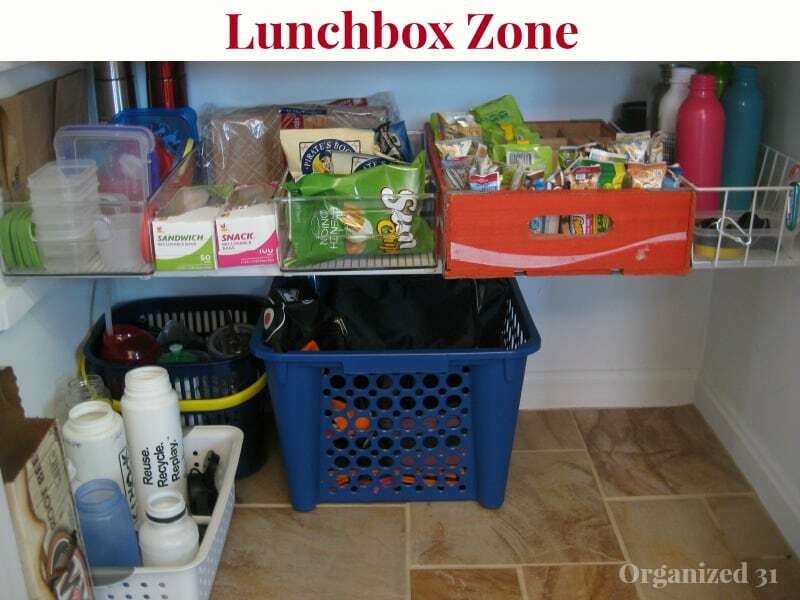 Or a lunchbox zone with everything needed for making lunches. Or a breakfast zone with everything your children need in the morning to make their own breakfast. This is great way to help your children become independent. If you have young children or pets, be sure to put all chemicals, breakable glass and sharp knives up out of their reach. Also, don’t put heavy items on top shelves (you don’t want them to fall on you as you’re getting them down). Don’t store chemicals on a shelf above food items (you don’t want the chemicals to spill or leak onto your food). Don’t place plastic bags or soft plastic containers near the oven where they might melt. 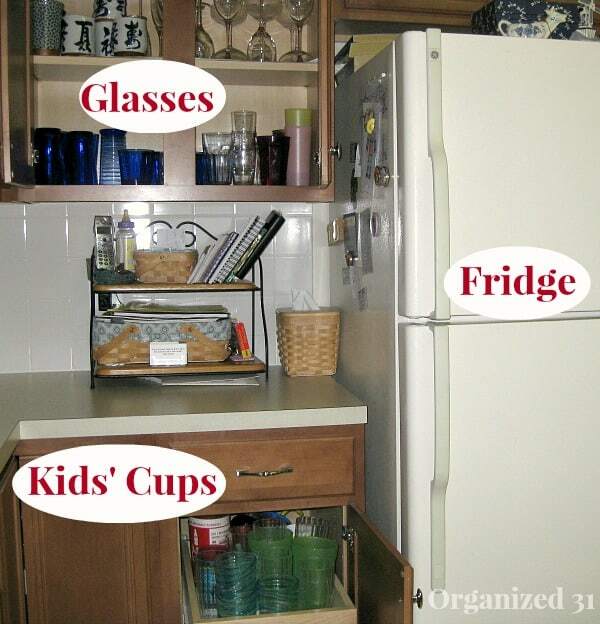 Plan the layout to make your kitchen efficient and as safe as possible. 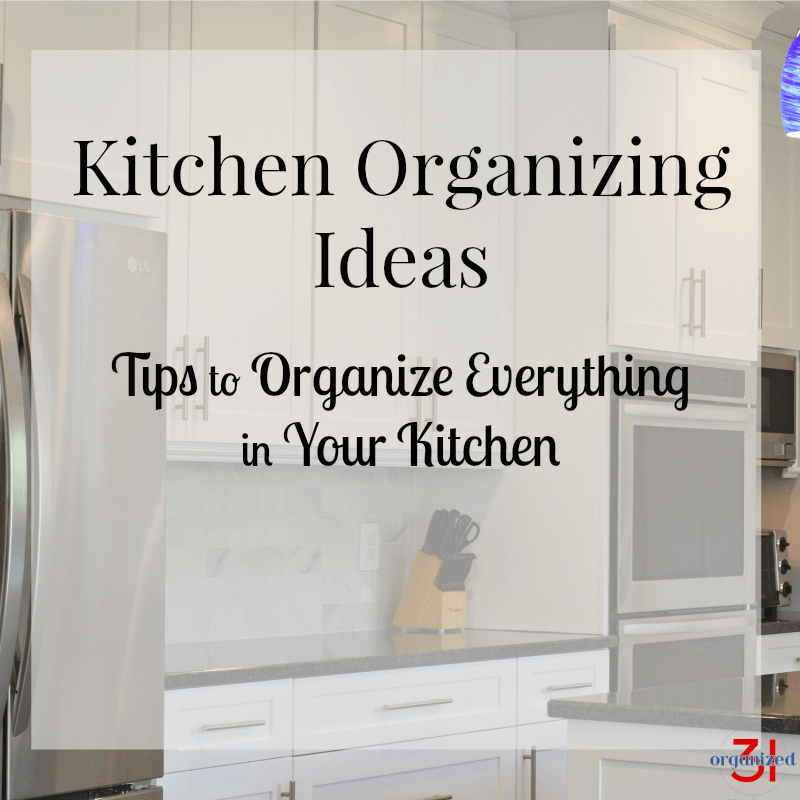 Sometimes no matter how much planning you do, you may just have to store an item where it will fit rather than where you would like to keep it (in a perfectly organized and designed magazine kitchen). Let the perfection go in this case and just accept the reality of your kitchen. And dream of your perfect kitchen as you’re playing Twister trying to get the roasting pan out of the back of the cabinet and out from under the stack of pans and around that bar in the middle of the cabinet without knocking down the stack of sippie cups and without passing out from the blood rushing to your head. Sometimes you just have to go with what will work not what’s perfect. Keep in mind that what works for you today, may not work for you in the future. Our lives change. We add more people to our family or downsize our belongings. We gain new kitchen appliances or inherit a treasured set of china. Don’t be locked into your kitchen layout if it has stops working for you. Evaluate what is working and what’s not working and then make changes that will fit your new situation. You can see more about how I planned my kitchen layout in my last house and in my current house. What are your favorite kitchen layout tips? Susan, I love the drum lamp! Gorgeous! Heather, I am so with you on not having to get up for every request (once the little ones are old enough, of course)! It’s a beautiful day when you organize your kitchen so your kids can help themselves. Well, my kitchen is 160 cm . It is tiny and I don’t go in faraway steps. Everything is in the 160 cm 😀 . I will share this challenge of organizing my mini kitchen very soon.